Hello, hello!! Have you been enjoy Disney Week so far? I have!! I love seeing the creative ideas from all of my blogging buddies. There is SOO much talent in this world! I love it! I meant to post this yesterday, but life gets crazy with two little ones at home, so I am going to share it tonight and then tomorrow you are going to get even MORE fab Disney posts! After all, there really isn’t such a thing as too much Disney, am I right? 🙂 In the meantime, tonight I am going to share my Disney Ticket Stub Frame with you. I have always been a ticket stub frame master. I am very sentimental and always saved all of the ticket stubs when I started dating a new guy in college with whom I was particularly smitten. If those relationships got serious, then somewhere down the road those fellas would inevitably get one of my ticket stub frames with a pic of us inside of it. I loved making those things. I made one for my husband when we got engaged, but it is packed in a box somewhere in my dad’s basement (we are living with him to save money at the moment), so I couldn’t share it today. Another post on another day! 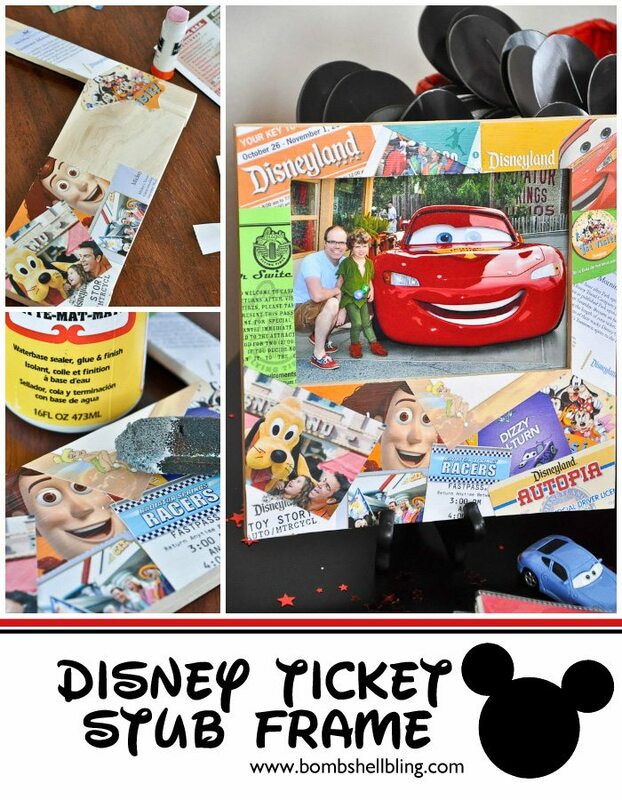 Today I am sharing the ticket stub frame that I made using all of the ticket stubs, buttons, maps, and other memoribilia that I collected and saved during our family’s unforgettable trip to Disneyland a few years back. Begin by laying out your various papers and arranging them in a variety of layout possibilities. If you don’t want to cut your actual ticket stubs and papers you can color copy them ahead of time and use the copies. This gives the added bonus of the pieces all lying flat during the Mod Podge portion of the project, which gives the frame a very smooth, finished look. I used to always copy them, but this time around I went straight for the stubs since I had so many. Begin cutting your papers to fit. I like to have mine overlap in a variety of directions, often even with large pieces lying underneath smaller pieces so that they peek through in a variety of spots. I am something of a perfectionist about these frames, so I like to do quite a bit of cutting and planning before I ever glue. One thing that I do is lay the papers approximately where I want them and use my fingernail to fold the papers down where I will need to cut, as shown below. Then I start glueing things down in sections, repeating until the frame is completely covered. 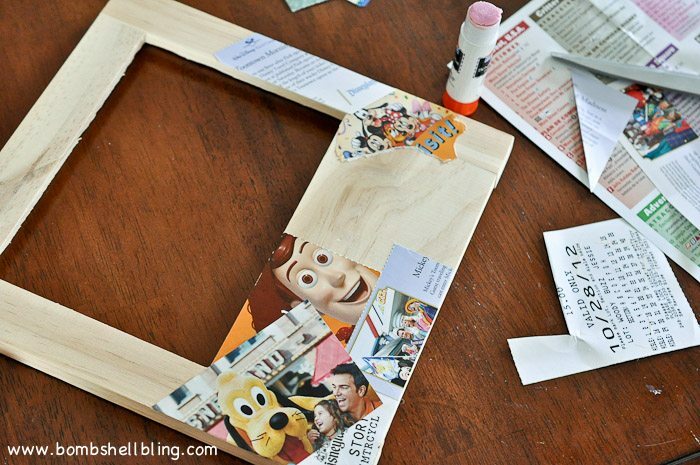 Once your frame is covered with your ticket stubs and papers, you can coat the entire frame with a thin layer of Mod Podge. 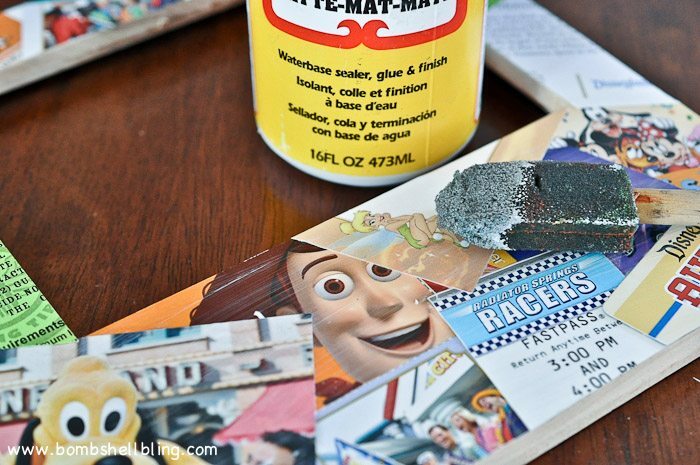 Once it dries completely you may want to add a second thin layer of Mod Podge. Now just add your favorite Disney vacay photo! I love this shot of my silly little boy wearing his Peter Pan Halloween costume (we were there on Halloween) with his hero of the time, Lightening McQueen. Oh man I miss those chubby cheeks and ringlet curls. 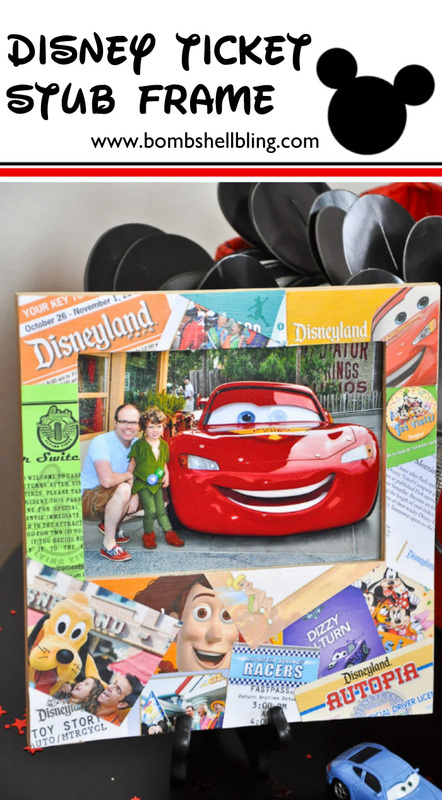 Isn’t this the FUNNEST way to display your Disney vacation memories? I think so! Oh, how I LONG to go back!! I TOTALLY love this idea!!! 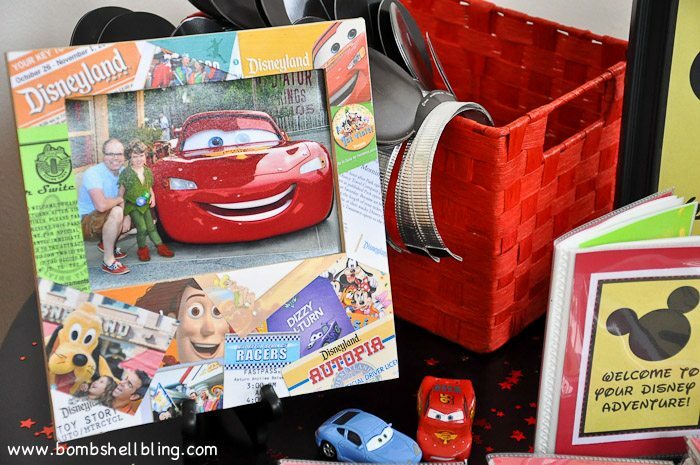 What a perfect way to display multiple memories! This is seriously brilliant! 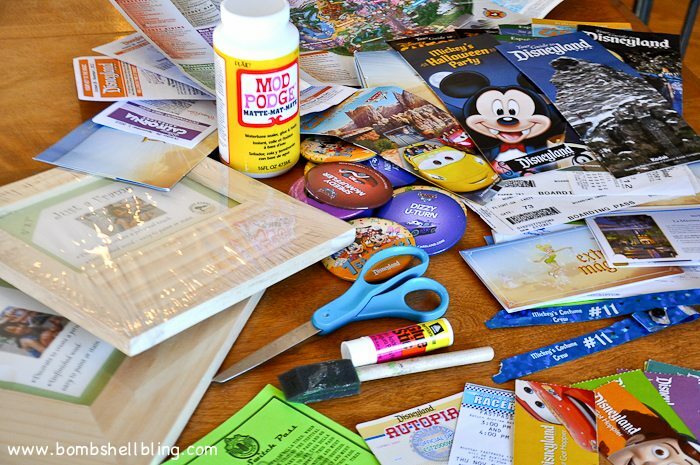 I have a big bag of stuff I saved from our last trip, too – now I know what to do with it! Thanks for letting us play along this week – it’s been fun! What an awesome frame. I will have to keep this in mind. We go in August! What an adorable way to remember such a fun trip! Love this craft! I had to pin it and G+ share it too, hope it helps 🙂 Thanks for sharing this with us at the Dishing It & Digging It Link Party, we loved reading it. Have a great week. 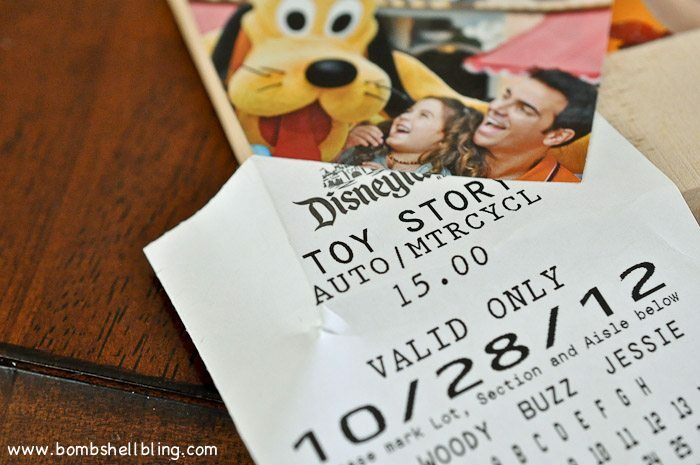 What a great idea for all of those ticket stubs. Thanks for sharing at Over The Moon Party. Hope you come back next week so I can stop by again. I hope you will also share at Thursday Favorite Things this week. Oh I love this idea! How clever, and a great way to preserve memories without it all becoming too much clutter.